The famous pig by Belinda Ziegler is at the moment in the Live Art Cafe in the Kunsthaus in Weiz. 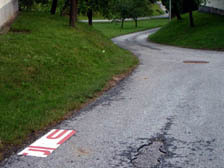 As part of an exhibition by Kunst Ost it will be visible there for about three weeks. The Wd8 team is on the road in Europe since September 2009. At the moment the team is located in the Netherlands, where it will try to establish a virtual version of the Wd8 cultural center. The next projects located in Walkersdorf and surroundings are planned for summer 2010. Floods in Austria. The videos are giving an impression of the situation in the region around Wd8. Wd8 present itself as part of the exhibition 'Mensch ist Mensch' in Pöllau near Hartberg with a real traditional kitchen and smoke room. Inside this true Wd8 environment several works, which were all made at Wd8, will be presented. The exhibition can be visited until October 2009 in Schloss Pöllau. On Sunday, June 7, 2009, there will be a special family day, with workshops and presentations. Wd8 will also present itself on this day. The old Wd8 kitchen will offer the possibility to create funny money wallets from empty Tetra Pak cartons. 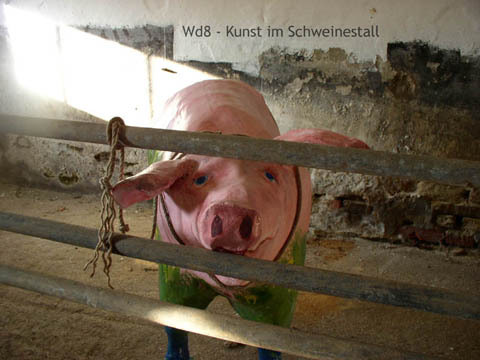 The Wd8 pig in the exhibition 'Mensch ist Mensch' in Pöllau near Hartberg was especially honoured in the Kleine Zeitung today. 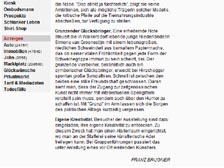 The article by Franz Brugner can be read (in German) here. The opening of the exhibition is tomorrow, May 8, 2009 at 6pm. More information about the exhibition is available in German at the styrian summer_art website. The opening of the exhibition is on Friday, May 8, 2009. The video shows a preview of the installation in Pöllau. 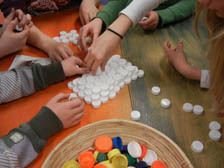 Connected:09 invites artist from July 10 - July 18 to Pöllau to create works and interventions to the theme of recycling. Interested artists can send their application until May 11, 2009. More info is at http://connected.mur.at/2009/apply.html. The recycling works made in Wd8 will be presented during two weekends at the Easter market in gallery 'Alte Raika' in the former Raiffeisenbank in Nestelbach im Ilztal. 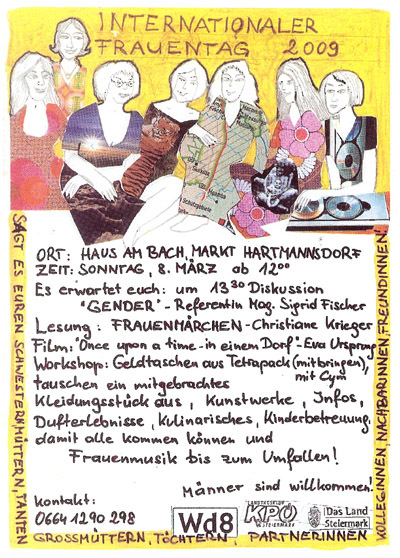 The Film 'Once Upon A Time... in einem Dorf' by Eva Ursprung as well as the film 'Shadow on the Wall' by Rot Pulojva, that were both filmed at Wd8 in 2007, will be part of the international women's day event at Haus am Bach on Sunday, March 8, 2009. Starting at 12:00h, free entrance! Wd8 Videos are now available on Vimeo: http://vimeo.com/channels/30920. 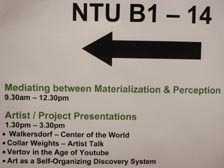 Cym will present Wd8 today at Interfiction, a Sympoisum in Kassel during the 25th Kasseler Dokfest, the Kassel Documentary Film and Video Festival. After the presentation she will give a workshop to create your own recycling Tetrapak wallet. The Film 'Once Upon A Time... in einem Dorf' by Eva Ursprung will be presented in the kunstGarten (artGarden) in Graz on Saturday, October 4, 2008. The presentation is part of the 'Long Museum Night'/ART ON NATURE 2008 in the kunstGarten (artGarden). On August 15, 16 and 17 Wd8 will again become the center of the world. During three days, from 10am until 6pm, the small art center will be open for the audience. Entrance is free. There will be coffee, cake, soap bubbles and hulahoops. On Saturday evening, August 16, 2008, starting at 8pm, the film 'Once Upon A Time... in einem Dorf', by Eva Ursprung, will be presented. 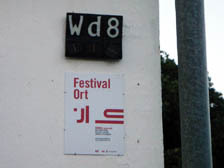 The project 'Walkersdorf - Center of the World' will be presented at ISEA2008 today. ISEA is the biggest International Symposium on Electronic Art. This year it takes place in Singapore from July 25 until August 3, 2008. 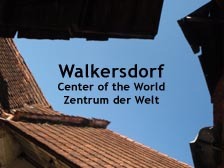 On July 5th and 6th, 2008, the project 'Walkersdorf - Center of the World' will be presented. During these two days, beside other works, the installation by Slovenian artists Luka Dekleva, Luka Princic and Pila Rusjan will be presented. The project will be presented as part of the Regionale08. Wd8 has been invited by Pavelhaus to join the Regionale. The official opening of the Regionale08 will be on July 4th in Feldbach. On July 5th, all the projects, that are connected via Pavelhaus to the Regionale08, will be presented in Laafeld (Bad Radkersburg). On April 17, 2008 there will be a small event at the Cabinet, in the courtyard behind gallery Škuc in Ljubljana, Slovenia. During this afternoon one of the Wd8 surveillance cameras will be mounted on the wall in the courtyard. The opening of the camera will be in the afternoon, between 16:00h and 19:00h. More about the Cabinet. Similar like in 2007, there will be regular news updates again in 2008. In 2008 these news items will be collected in the Wd8Log. News from 2007 is available here. News from 2006 is available here.